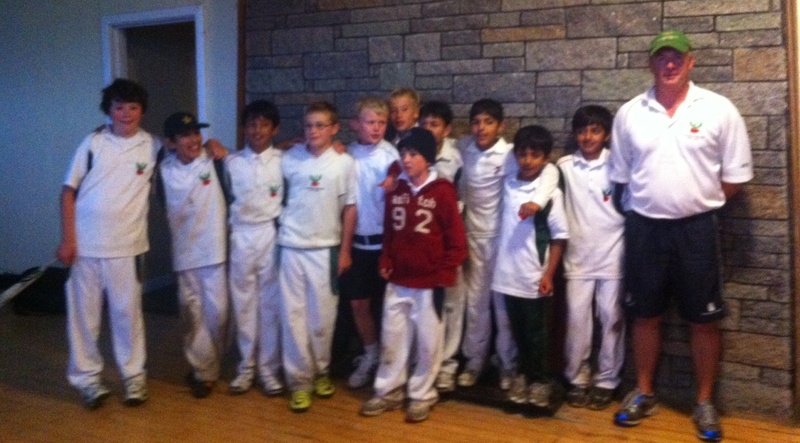 The first silverware of the year was secured in a tense finish down in Cabra as the under 11 B’s pulled off a dramatic last over win the get home by 2 runs. A wicket with just three balls remaining saw Phoenix over the line. 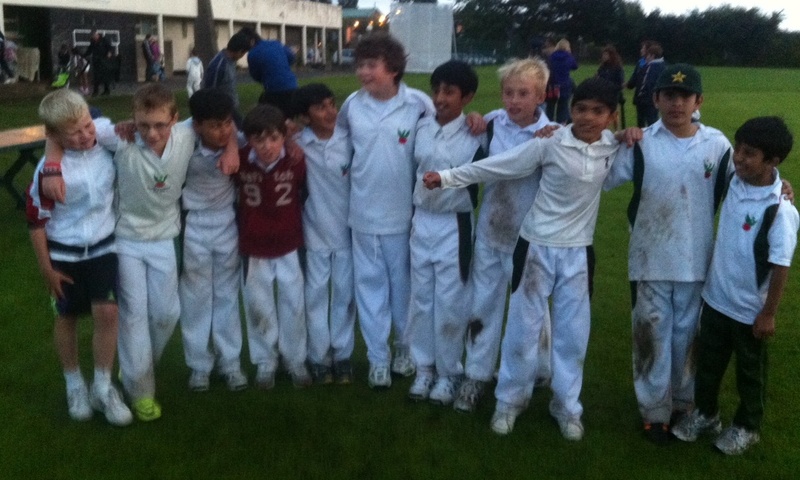 Under 11 B Cup Champions 2012! Big matches rest on big moments and a Cup Final is one of those occasions. The player under pressure on this occasion was Finn Reid and he proved more than up to the task as he snagged the winning catch at long off. That said it was a great collective effort from the team on the day and over the course of the season as well as off the field with all involved highly deserving of praise. Now just damp and dark rather than wet Phoenix trailed by two with two balls left. The ball comes high and hard to the determined Finn Reid at deep mid off who watches motionless and takes the catch with ease. Now 3 up with 1 ball to go order was restored by independent umpires. Abdullah bowls a dot and joy is unconfined. Indoor presentation follows and the trophy is entrusted to the 3 Azams. Drama and romance aside victory was deserved after disciplined batting and excellent bowling under pressure with a victory target for Belvo of 53. Particular mention for Hasan Azam a straight bat! And doing most of 5th bowlers work, the classy Samran. Also Jamie McGovern for recovering from being given lbw to bat and bowl superbly. 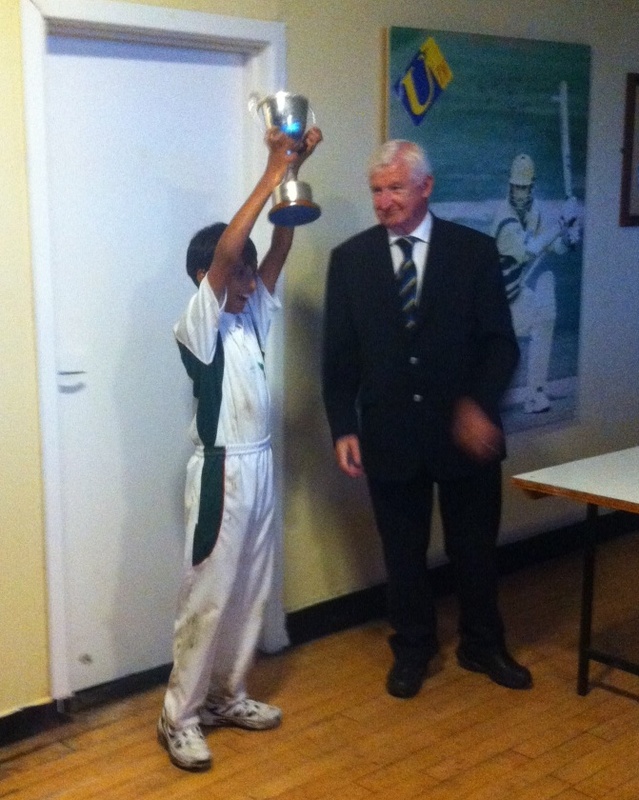 LCU man of Match Hasan Zaidi and the irrepressible Ali at fine leg. However all deserve praise as do Belvo for the way they took defeat. The boys Alan and I would like to thank all who have helped us this season. The Committee, Coach Matt, James. Semi final supremo Cleere, Albert and Kelvin. The coach with his first trophy winning squad at Phoenix! It’s not quite Vitai Lampada but I’m sure Sir Henry Newbolt would approve.